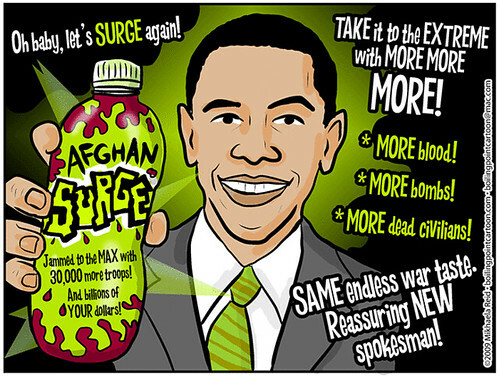 Boiling Point Blog: Feminist, LGBT and progressive political cartoons: Cartoon: Urge to Surge 2: Afghanistan! Clever one, Mikhaela. I like the idea of comparing war to a product that needs to be marketed to the public, since that what wars are (especially needless ones). So the next question I ask myself when I see the minimal change in foreign policy between Bush and Obama is: why? The answer I have come to is that the military-industrial-prison complex has control of foreign policy, not the president. And they make money off wars. I'm a huge Obama fan, and to me, there is a massive difference between his foreign policy and Bush's. He does virtually none of the things that drove me crazy about Bush, and has almost none of Bush's dreadful beliefs. My answer for why there appears to be no difference to you all is because you are so far to the left, you barely notice changes in policy if they are within the mainstream of the political spectrum. Thankfully you aren't in charge of our country.